#2016bestnine - My 9 Most Favorite Outfits of 2016. Happy Twenty Seventeen you all! So, I promised a Holiday 2016 Home Tour and that is coming right after this post, I promise. But today, inspired by Instagram's #2016bestnine (the best nine of 2016), I wanted to share with you all the 9 best looks of 2016 that I have previously shared on the blog. I say the 9 best outfits in my opinion of course, (my 9 most favorite) I wore which where blogged, because there were at least another 70 outfits that were never blogged, some were never photographed and some never made it to the blog due to lack of time and as you saw I only blogged an average 4 days a week this past year. I must say 2016 in general was a very busy year for me as I started working a lot and not only part-time. Also, between this week and ending next Thursday I will show you the rest of the Dresses I wore for Dressember so it will be a busy first month of the year for the blog, as you can tell. "Anjolee and Snow" - January 2016. This outfit is a great representation of how to layer for super cold, snowy and windy Winter weather while still looking very comfortable, stylish and colorful. All the Winter Accessories: Infinity Scarf, Panama Hat, Fingler-less Gloves, OTK Boots and Fur Coat work so well together in this look. This was also the post where I collaborated with Anjolee Jewelers and showed off a Pretty Ruby Tennis Bracelet. "Serenity and splashes of Rose Quartz" - February 2016. This is a great way of incorporating 2016 big IT colors, both Serenity (Baby Blue) and Rose Quartz (Blush/Baby Pink) by pairing them with Crisp, Fresh White. The two pastels against the white look so soft and clean. But I did add a color splash or two, with my Red Purse, Crimson Lipstick and Jewel-Toned Statement Necklace. The best thing about this outfit is that all the items from this outfit (with the exception of the skinny jeans) were about a decade old. You can still wear today's trends by shopping your closet. "Everything is New" - March 2016. This outfit is from March 1st - a very special month for my blog - it is the month and the exact date I launched my new upgraded blog, for which I worked with a professional website designer. 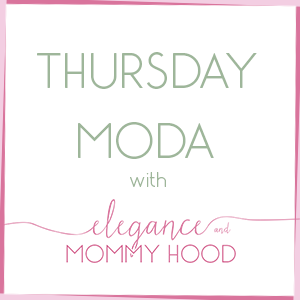 It was also the day I started my "Thursday Moda" linkup which had 70 entries on its very first week (on March 1st) and has grown and continues to grow strong each week. Of course I had to celebrate by wearing a brand-new outfit. Everything I wore, including the jewelry and accessories, was new. Black+Navy paired with Cream look sophisticated together and the Multi-Colored Blanket Scarf was the perfect addition. In this post, I co-hosted my very first "Thursday Moda" with the lovely Emily from Darling Dearest (pictured above) and this was also a very special week for Elegance and Mommyhood, because every other day that week I collaborated with Emily to show of how we style our different Blanket Scarves (we both have quite the collection). 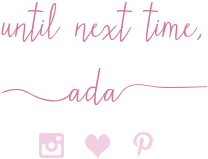 This post was also my first collaboration with Rocksbox Jewelry. "Casepp Custom-Made Phone Case and Pink Flamingos" - April 2016. There is something so fun, girly, happy and joyful about this outfit. Once again I paired Rose Quartz and Serenity together and lots and lots of Famingos: in my clutch, my watch, my phone case and my scarf - and they were all pink, too. This was also one of the many times I wore one of my several Laceup Ballet Flats and in this post I collaborated with the wonderful European Company Caseapp which custom-made for free my bright and fun Yellow iPhone case, which I designed myself. 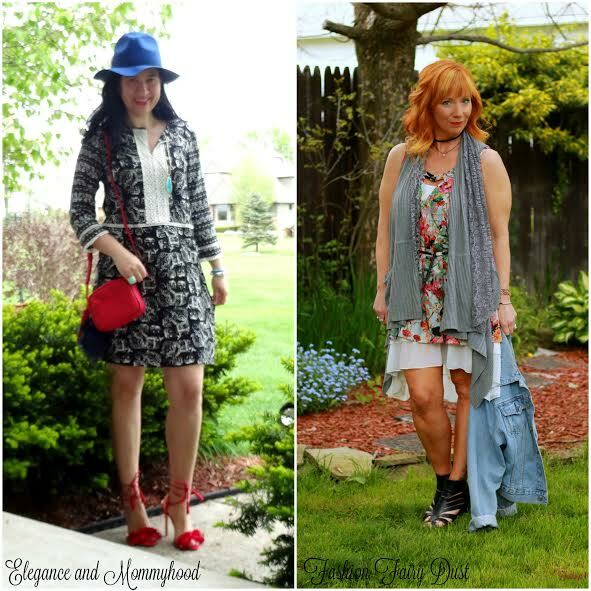 "Spring Bohemian: Embroidery, Fringe and Pom Poms" - May 2016. May is my birthday month but my favorite outfit all of this month wasn't one of the three I wore to celebrate my birthday. Instead, it was this dressed up version of a Spring Bohemian Look, the very first one which kicked off an entire week of Spring Boho Outfits, where every other day I collaborated with the Fierce Debbie from Fashion Fairy Dust (pictured above) who is the queen of Bohemian Outfits. I have purchased many dresses from Target in 2016 but this LBD with the White Elephants is one of my favorites by far and those Red Stiletto Pom Pom Shoes were some of my favorite shoes I wore in 2016, ditto for the Royal Blue Panama Hat. Now that I am doing this recap of my nine best looks, I noticed that my top favorites include several outfits I have worn hats with. Oh well, 2016 was the year I wore a lot of hats. "Black Eyelet Dress from Day to Night" - June 2016. This dress, especially styled for the day/daytime look is my favorite LBD worn in 2016 and also my second most favorite dress from "Who What Wear" - that amazing, modern, classy and super affordable line at Target I cannot stop buying. In this Thursday Moda post I styled the dress for daytime (pictured above) with the white sneakers but there is also a fancy, glam and lady-like evening look with some ankle-strap Black Pumps, so check it out. This was also one of my most commented and most complimented posts and outfits of 2016, for sure. This is hands down my Best Athleisure Look of all 2016. "A Taste of Brighton" - August 2016. Sometimes the best outfits are the ones that don't require much. In truth, this is just a pair of Colored Pants and a Floral Ruffled Blouse tucked inside the pants, but it is very elegant, put-together, stylish and comfortable in its simplicity. The Cognac Accessories worked together for a late Summer look - almost transitioning into Fall - and I was having a great hair and makeup day despite the high humidity. Better yet, it was a great late afternoon and evening spent down-town beautiful Brighton of Michigan and I loved the location of these photos. "Posing in Plaid with Vivian" - October 2016. This was the first Plaid Dress I wore this past Fall+Winter season and I love how vibrant it is because of that Gorgeous Kelly Green shade. Back in October I paired it with my Gorgeous Cranberry Block Heel Sandals but (though you haven't seen it yet) this dress got worn again over the December Holidays and will be posted on the blog, soon. Another special reason to love this post is my little girl trying to mimic mommy and posing with me. "Who What Wear for the Holidays" - December 2016. Even-though the #2016bestnine looks weren't a count-down, I can easily say this is My #1 Most Favorite Outfit of all 2016. I knew for a fact it would make this Top 9 list. 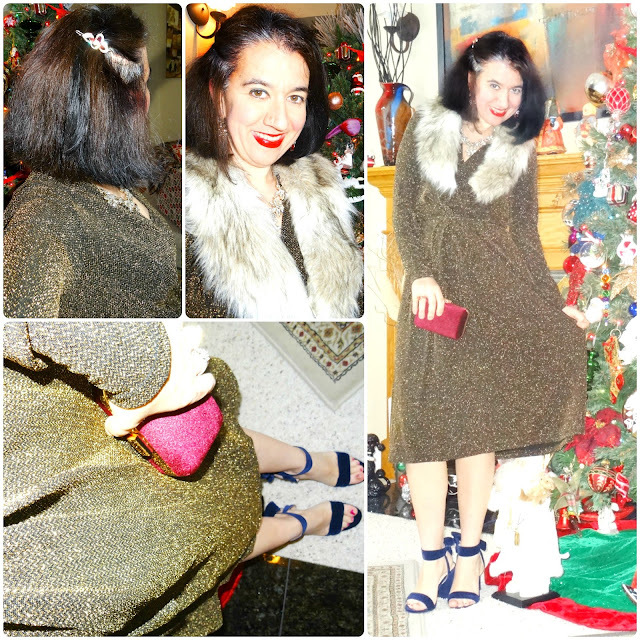 Though I featured several Dressy Holiday Outfits in December (just last month), this was hands-down the best of them all! This particular outfit was also the most vivid one in my memory since it was worn just a few weeks ago and I wore it to my work's Holiday Party. 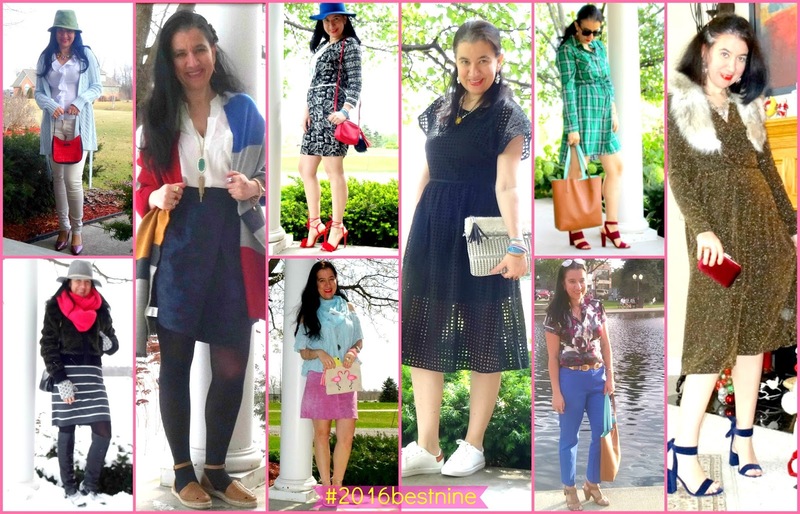 I mentioned above my Favorite Who What Wear Dress of all 2016 (in my athleisure look from June). Well this Wrap-Style Golden Metallic LBD is my second favorite dress I purchased from Who What Wear last year (I probably own at least 7 of their dresses by now). 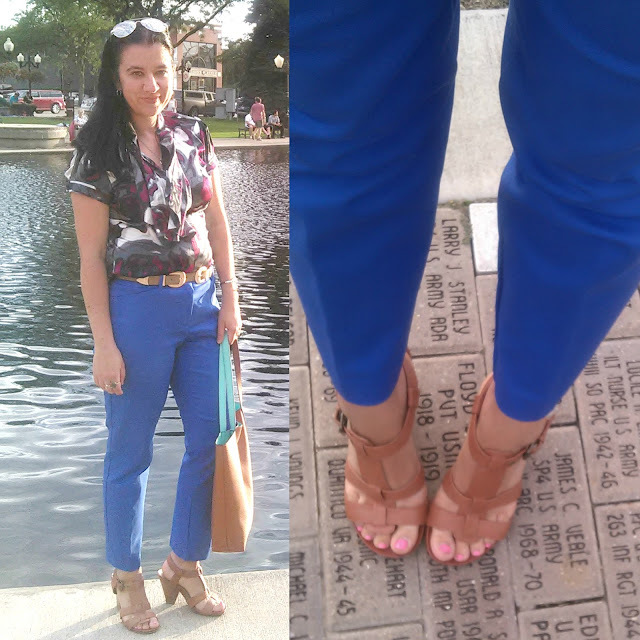 The Midnight Blue Bow-Back, Block Heel Shoes I paired it with (also from Who What Wear) are my favorite shoe purchase of 2016 and the Little Cranberry Box Clutch (once again by Who What Wear) is my favorite bag purchase of 2016. Both the shoes and bag are velvet which is the perfect festive material for the end-of-the-year holidays. So, now that we are at the end of this long post, which is your most Favorite Outfit of my Top 9 Looks featured above?! Here is to a Very Stylish, Dressy, Fancy, Put-Together, Glam and Happy 2017!